Lately, I’ve been thinking outside the box. I love a black box space. It’s such a magic place where anything can happen. But I have family members who’ve never stepped inside a 99 seat theatre. They likely never will. Neither will dozens of “non-pro” friends who love me and support me but can’t imagine why they’d drive to a dicey part of town and sit in uncomfortable seats that are way too close to the actors. My last few theatrical ventures have taken me far away from black boxes. One play – QUENTIN – was a commission to write a one-person show about the youngest son of Theodore Roosevelt that would be performed as a tour of the neighborhood around the White House. The premise is that a tour group is waiting for its guide to show up. Quentin, on his way to Walter Reed for a physical exam before he joins the flying corps in World War I, is hoping for a reunion with his childhood pals known as the White House Gang. The gang never shows up, but Quentin offers to take the tourists around and shares his life in the White House. QUENTIN is still running every weekend in Washington, DC. Another commission, QUEEN OF THE WATER LILIES, began its life as a ten minute play with your usual staged readings inside a black box. It’s the story of a Helen Shaw Fowler who fought the Army Corps of Engineers to save her water lily farm and in the process, preserved the only remaining tidal wetlands in Washington, DC. As I continued to do research at Kenilworth National Park & Aquatic Gardens, the rangers became the biggest fans for the play and invited me to stage a reading on the very site where Helen’s house used to sit. Grants appeared from both coasts. DC’s Environment director offered to introduce the play and give an update on the health of the Anacostia River. On Earth Day last year, 99 people came to hear a play in the very setting where the story took place. It was the very definition of an “authentic” experience. Theatre in non-traditional spaces is certainly nothing new. Theatricum Botanicum has been performing in its Topanga Canyon garden for 45 years. TAMARA took over the Hollywood American Legion Hall in 1981 for a sold-out run. Theatre 40 has invited audiences to experience THE MANOR in the historic Greystone Mansion for nearly two decades. This past fall, Rogue Artists Ensemble was in residence at Plummer Park for SENOR PLUMMER’S FINAL FIESTA. The audience for SENOR PLUMMER was young, hip, and thought it was beyond cool to see theatre in its unnatural habitat. My goal for 2019: to find more non-traditional homes for my work. Now that I’m back in Los Angeles, I get to be a tourist again and rediscover places that might lend themselves to an afternoon or evening of theatre. That includes the place between your ears: audio drama. 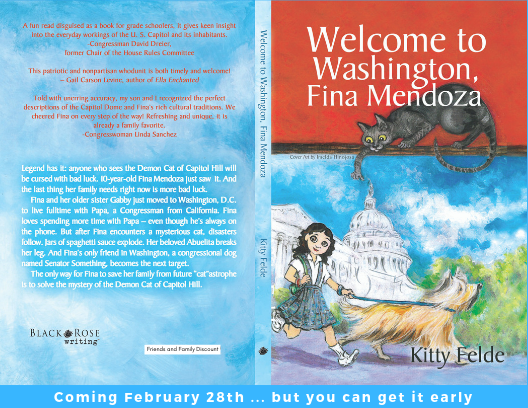 My first book WELCOME TO WASHINGTON, FINA MENDOZA comes out in late February. 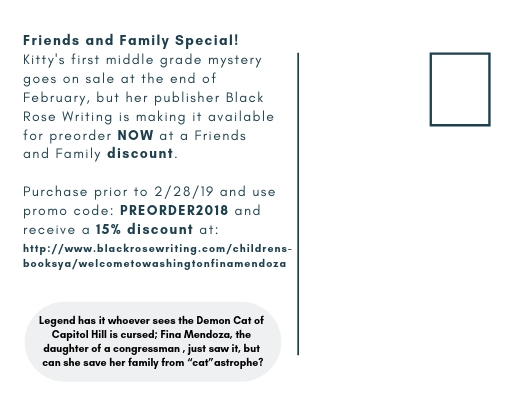 It’s a mystery for kids set on Capitol Hill. After the book tour, I want to turn the story into a mini-series podcast. No black box required. I’ll keep you posted. Very inspiring. Congratulations on your successes and may there be more to come!